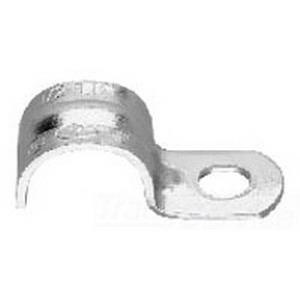 Crouse-Hinds 1-Hole Snap-on light-gauge clamp of trade size 3/8-Inch, helps to join EMT conduit to armored cable, metal clad cable or flexible metallic conduit. This clamp in zinc electro-plated finish, features steel construction. It has dual gripping saddle design on the coupling that safely secures cable or conduit in place and prevents loosening from vibration. This clamp comes with steel compression ring and nut for providing strong secure termination point to EMT conduit. It is suitable for EMT conduit.